Right now we have a giveaway going on for a Sunsine Audio Limted Edition Gold Harmonic Decoder. Today we wanted to do two things. The first is to EXTEND THE HARMONIC DECODER GIVE AWAY TO THE 27th OF NOVEMBER 2015. That’s this Friday. We just realized that we wanted to give the folks celebrating Thanksgiving a few more days over the holidays to get their reviews in for a chance to win. So don’t eat to much Turkey and fall asleep on the couch. 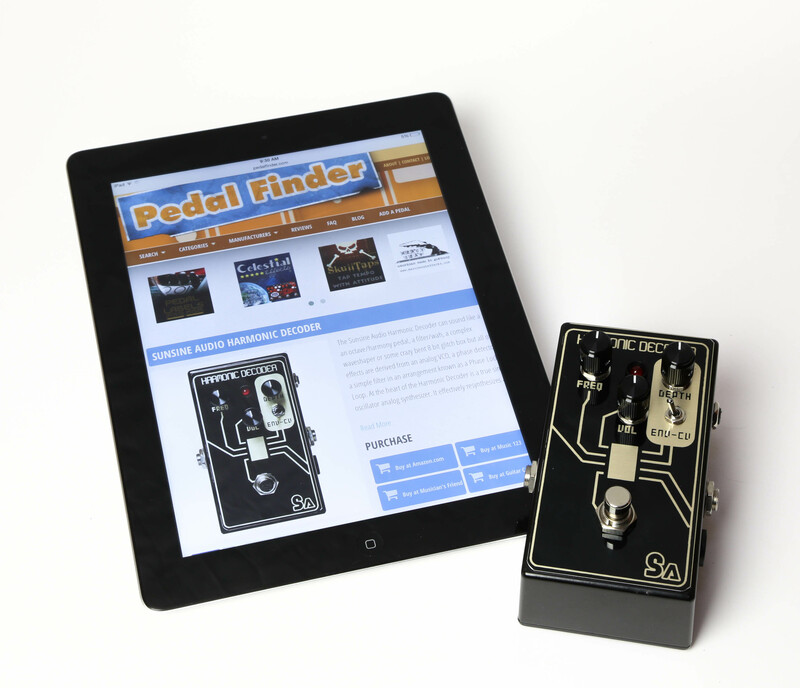 Eat to much turkey and then take the time to add a few reviews to Pedal Finder! For those of you not eating turkey – you just get a few more days for nothing. Enjoy! The second thing we wanted to do was to take this opportunity to post an interview we had with the owner/builder at Sunsine Audio – Fletcher Kaufman. We all love effects Deciphering circuits is a blast and plugging into new sounds and tones is a passion that many of us share. But, the reason we love the small, boutique builders working out of living rooms and garages is because of the people behind the electronics. Interviewing builders gives a snapshot into the beliefs and ideals behind company giving us a great appreciation for the boxes they produce. At least I think so. So the following is a series of questions that Fletcher was kind enough to take the time to answer. You started out primarily designing presets for a bunch of different iOS Synths and hardware synths (and have won numerous awards for apps such as Gestrument). For the uninitiated like myself, what goes into preset and sound design? Is there any similarity to designing a circuit? Firstly, thank you for inviting me to be interviewed, it’s a pleasure to be asked to share my experience and perspective. I am in a fairly unique position in the industry. There are not a lot of people that I am aware of that work both in sound design and also design and/or manufacture their own hardware, and I believe there are definite advantages to working in both fields, and both disciplines inform one another. Doing sound design has given me an insight into the value of presentation of an instrument, as well as a valuable look into what customers expect or prefer. To essentially see the picture from both sides. Sound design requires working within the framework of the parameters of a particular instrument or effect. The structure of the instrument and the available options are a result of the design prescribed by the manufacturer. Outside of something that is sample-based, the results are entirely shaped by the internal options available. I think the most important parts of designing content for an instrument are knowing the instrument and options well, and to think like a musician, to design something that is unique but also musically useful. If the presets being designed are for the “factory” soundset (meaning the sounds ship with the instrument) you want to emphasize what is special about the instrument, and besides providing bread and butter type sounds, deliver a few showcase type sounds that are more complex or tightly coupled. There is very little direct crossover in designing presets and designing circuits, but the core ideal remains the same, and the final goal is remarkably similar. How will this be used? What are people looking for or expect? What excites me as a musician about this? What makes this different? These questions are always constant and begging to be answered. How has your sound design experience influenced your pedal builds? One of the most important lessons I have learned is how different companies operate internally, from some the most recognized and celebrated to the scrappiest of one person operations. Another is the importance of thinking like the end user, of how an actual musician will relate to the end product, which is something that is occasionally missed or misstepped when an engineer with little real world musical knowledge is involved. I’ve learned that larger companies run the risk of watering down their content to appeal to a larger market, whereas smaller companies can lose perspective and only see the details but not the larger picture because of how personal a project is. Somewhere in the middle is a sweet spot of innovation and lean, informed and decisive action. The Vanishing Point Fuzz and the Harmonic Decoder are both pedals that aren’t necessarily just for guitar. What unique problems or joys arise when you design a circuit to meet the needs of multiple instruments? The problems are multifaceted, and often revolve around the content of the circuits themselves. Drive type circuits are possibly the most difficult to design for a wide frequency range. The sound of distortion (be it traditional distortion, overdrive or fuzz) is directly connected to what frequencies a given circuit allows in or rejects or affects in varying ways across one or multiple gain stages. These drive-type circuits are often seen as fairly simple (and often are) but there is so much tonal variety available by simply allowing or disallowing specific frequencies, just look at the mid-range hump of a Tubescreamer, or the mid-cut of a BigMuff, these would be clearly and wildly different sounding circuits without the unique ways they handle the frequency spectrum. The joys and benefits are perhaps obvious, more instruments means more fun. I think it’s easily apparent that everyone wants fun and expansive tools, not just guitarists, and if they can be accommodated why not? Secondly, in a much more more personal and self-serving way, I want to run my own basses, drums, synths, voice etc through these things, and it’s a pleasant surprise when the device can accept that and act naturally and uniformly across the board. It can be a difficult task but that’s the line I try to balance on. On that note, I have discontinued the Vanishing Point. It may make a reappearance in the future in a more versatile and intriguing form. What’s your favorite part about the design/build process (for pedals) and what is your least favorite part? By far my favorite stage is the initial idea/design phase. Dreaming big and wide, and trying to distill the essence and most important aspects of what is available. Hammering it into a form that is ready for production is enjoyable but also bittersweet. You are getting closer to a final product but at the same time making tradeoffs that affect the cost and performance (Do I keep this unique feature if it jumps the final price tag up but only a small portion of users will utilize it?). I love seeing it through to a finished product though, and hopefully delivering it in a way that keeps the best, most useful features while at the same time keeping the overall cost down. By far my least favorite part of the process is the nitty-gritty technical dimensional stuff (i.e. Is this 128th of an inch off?). Can you give us a verbal tour of your shop? Are you a one-man-show? Does all the work get done in one room? Who are the others that help? My shop is in a rather unique spot. The location is a large, historic factory complex that hosts a community of artists, businesses, entrepreneurs, musicians, and community groups. It takes the name the Pajama Factory from one of it’s former uses. My actual shop is pretty small. I have a couch and a small refrigerator, a coffee maker, an amp and a few guitars as well as a display shelf of previous work on one side. Farther into the space is were all of the manufacturing and prototyping is done, all the parts stored etc. All of the work is done entirely in this single room, and I work alone. I heard you enjoy long distance backpacking when you’re not boxing up fantastic effects. What are some of the trails you’ve conquered? What’s your favorite trail story? The longest trail I’ve attempted was the Appalachian Trail, and it definitely cemented my interest in long distance hiking. Naturally, walking up and down mountains and being outside for 6 months will have a major impact on one’s life, and ultimately after much contemplation it led me into starting Sunsine Audio. The flip side is that now I have much less time to pursue longer distance hikes, but I do enjoy getting out when I can, and my favorite area to hike in PA is the Black Forest/Pine Creek area and areas north and west of there. Some of the most remote, challenging and beautiful trails in the state are located in this area and I am lucky to be able enjoy them when I can. Probably my favorite trail story comes from the A.T. when I was hiking in northern Maine. I was hiking with a partner and we rose really early, around 3am to try and reach a river crossing in time to be ferried across. So obviously this involved traveling in the dark. After partially losing the trail a few times, we finally came to a smaller river that we had to ford on foot as the wooden bridge that had been there was destroyed in a previous storm. Being that is was October, you can imagine it was pretty cold. So, out of caution, we decide to ford the river naked in order to keep our clothing dry. I went first and as I stepped into the water I heard a massive grunting sound seeming to come from the water and within close proximity. It didn’t take long to realize this was a very angry moose, and if you know anything about moose you know they can be some of the most dangerous animals out there. Every single time we approached the shore it became aggressive, we tried hiking up and down the river to find another way around but this moose was not having it. We finally put our clothes back on and waited for about an hour a bit back up the trail, hoping the moose would leave. When we returned the moose was still there and still angry, and to compound the situation it was still pitch black out. We decided we had to get try and cross anyway and hope that it just left us alone. I went first again and this time I tried to cross as quickly as possible. That moose was only a few feet away standing in the water and the thought going through my mind was the newspaper headline “Naked hikers, found with only boots and packs on, trampled to death by moose”. Ultimately we made it across unharmed, but we missed our meeting later that day. I can only imagine what my friends and family would have thought I was up to if it had turned out differently! Absolutely, there are probably too many too name. I tend to be into the more experimental or strange effects and there are some really nice offerings out there right now. It seems like there is a lot of innovation outside of the normal overdrive/chorus/whatever if you search for it, and I hope this trend continues. It would be amazing if some of these smaller builders doing interesting things had access to some significant R+D money! Are there any local bands in Williamsport, Pennsylvania that our readers should know about? My personal favorite local bands actually aren’t really local anymore, but the scene in Williamsport is vibrant and active. For the size of the area we have a disproportionate amount of talent, thanks in part to a thriving arts scene as well as high caliber music schools and lots of groups passing through from Philly and New York. Key of V is one of my local favorites but unfortunately they are not very active anymore. Another group I am a big fan of, Clawfoot Slumber, has moved to Oregon but they are still cranking out great stuff. Could you please tell us about the Harmonic Decoder? It seems like a pedal that can do just about anything. What’s inside? The Harmonic Decoder is a PLL (Phase Lock Loop) circuit. There a few other examples of PLLs that either are or have been on the market (Schuman PLL, Subdecay Noisebox) but each of them including the Harmonic Decoder are pretty varied even if there is a bit of crossover. Sometime PLLs are used in octave or guitar synth style pedals as well, but those circuits are behaving much more nicely then the previously mentioned pedals. Ultimately, what makes the Harmonic Decoder interesting are the phase relationships, changes, and sidebands that occur. At first the effect may seem pretty random, but with enough playing around and experimentation it’s possible to predict or “tune” the pedal for the phrase or riff desired. I haven’t done a whole lot of research into the other PLLs but I am pretty sure the Harmonic Decoder uses a different chip and it’s definitely the only one to offer external modulation via the control voltage input. The control voltage input can be accessed from many different vintage and new analog synths, as well as Eurorack format modular systems and even iPhone apps! What’s the next effect, the next big circuit or the sound design direction that your headed next? I have a lot lined up for the future! In the immediate pipeline are a Eurorack module version of the Harmonic Decoder as well as a unique Eurorack dual wavefolder/waveshaper module. An interesting Octave down pedal with a few twists is also on the way, as well as a secret pedal project which I can’t wait to finish and release but also can’t discuss. Needless to say it will be versatile and genuinely new in the world of effects. I continue to work with various companies doing sound design, and some of that should see the light of day in the next few months as well. Thanks so much for the interview and interest! And that’s Sunsine Audio! Don’t hesitate to like them on Facebook or check out their website. Fletcher is steaming forward with new ideas and effects and your going to want to stay connected to hear about it first!